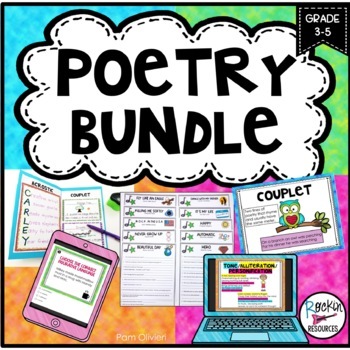 This POETRY BUNDLE is an inclusive teaching tool that contains everything you need to TEACH poetry throughout the year. 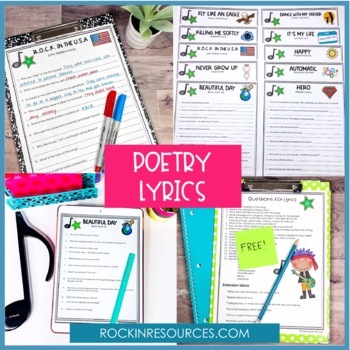 This resource includes anchor charts, student booklets, and practice pages to teach poetry elements, types of poems, how to analyze poetry, and analyzing poetry through lyrics. SEE PREVIEW AND EACH INDIVIDUAL PREVIEWS! SEE Poetry Slam Preview!! 54 Pages of Colorful full-size slides and 54 of the same pages with a white backfound and black text to save on ink. They are great to teach as a whole group and as posters. Directions are posted in the document on how to make 3.5 X 4.25 inch size cards using pdf. These can be used in small groups and centers! In addition, there are three poems with questions for analyzing and ten pages with review questions. 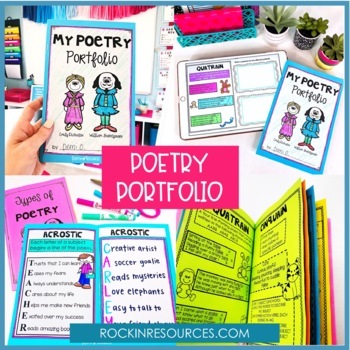 This poetry portfolio has anchor charts and adorable templates for students to write their poems! 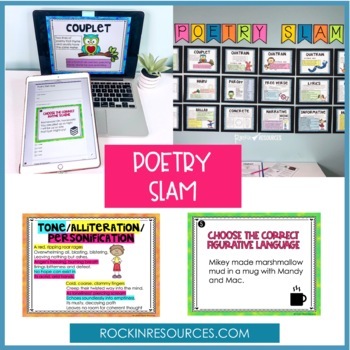 It can be used in class, at a center, or as homework since the anchor charts explain the rules of each poem with examples. When the booklets are completed, have a Poetry Slam and invite students to share their poems! ★★★★Instructions on different ways to create the booklets. Want to motivate your students to learn poetry elements? This is a generic list of questions to use with any of your favorite lyrics. I like to teach one song a month and my students beg for me to do more! I download the song for them to listen to as well! At the end of the year, they get to bring in their own lyrics to analyze with their peers. We jam out! Are you looking for other poetry products?